It’s been quite a weekend…. I’ve just got back from the Chelsea Flower Show. The KLC students were there en masse for our briefing on the three gardens we are going to be helping on. And I am star struck. We’ve had Ulf Nordfjell, Christopher-Bradley-Hole and Marie-Louise Agius talking to us about their gardens. I’m still pinching myself to check I’m not dreaming. But I’m going to wait until my next post to tell you more about Chelsea. Because the other thing I did this weekend was go up to The Idler Academy in Notting Hill to take part in their contribution to the Chelsea Fringe Festival. And that comes first. 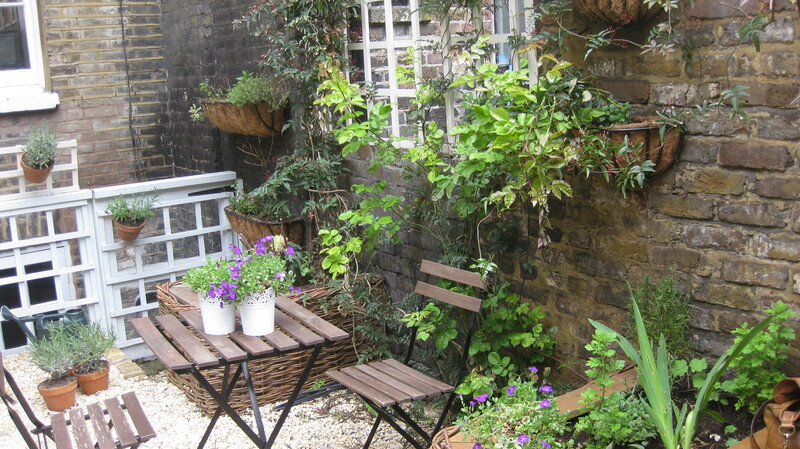 Mint Tea and Sympathy was the idea of KLC alumni Angela Newman to offer garden design advice to members of the public from the Idler Academy bookshop. Current students join up with previous KLC students for two hour slots, and it was my turn on Saturday. There are a few good things about this that I have to mention. 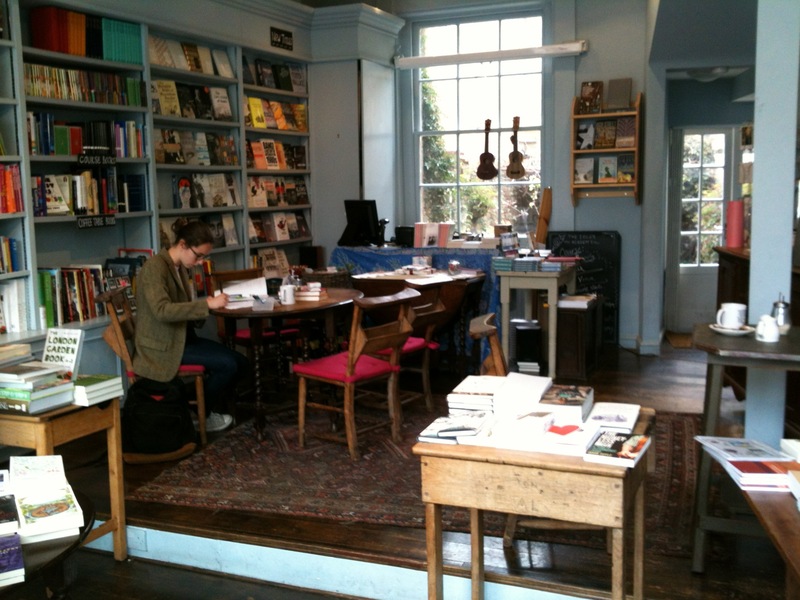 First is The Idler which is one of those bookshops you wish was just round the corner from you. Friendly, welcoming, great choice of books you really want to pick up and read – and all this with really delicious tea, coffee, cakes, scones. Second, there’s a really lovely little garden at the back of the bookshop, where you can take your cake and coffee – and the book you’ve just bought – and enjoy the honeysuckle and herbs. It’s a tiny little piece of gorgeousness – designed by Angela. And on Saturday between 1 pm and 3 pm it was a very pleasant place to sit and wait for the stream of people looking to Rachel Parker Soden (KLC last year) and me for advice about their gardens. So where were they? We ate cake, we drank coffee, we chatted about the course. We had a really nice time. But how pleased were we when a man came out from the bookshop and approached us. We sat up straight, we put on our best smiles – we mentally prepared ourselves to offer words of wisdom. Only to learn that he wasn’t looking for advice. 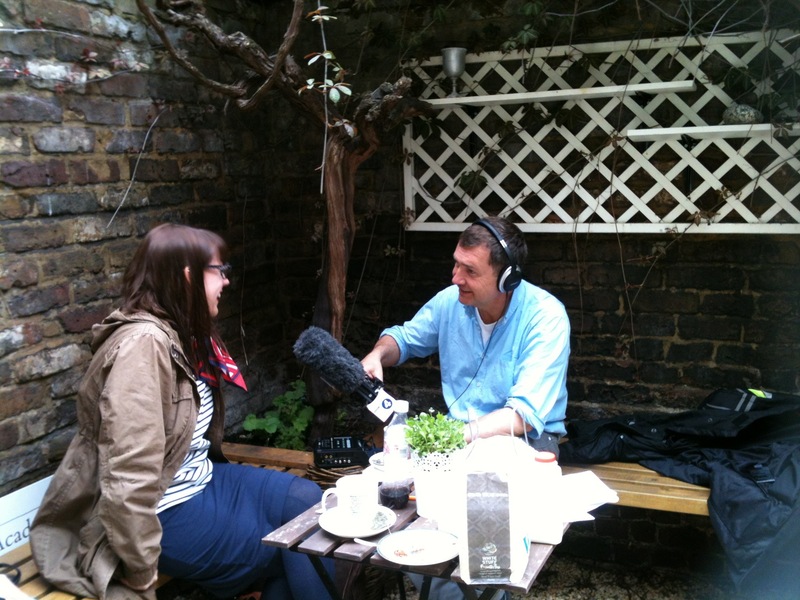 He was from Radio 4, and wanted to interview us about our involvement in the Chelsea Fringe Festival. So we might not have talked to punters about their gardens. But we did get to talk into a big fluffy microphone. Which was another first for me. And for those of you who are interested you might be able to hear what we had to say on Gardeners Question Time this Friday at 3pm. If they decide to include us…..